A two-wheeler’s noisiness, both in terms of amplitude and quality, is a topic that requires an extremely accurate check in order together the necessary data for the target achievement (noise level and quality). In the light of this, Engines Engineering designed and started a semi-anechoic room inside its general management, equipped with roll bench, suitable tools and test techniques, developed by experienced engineers, to face and solve the vehicle’s acoustic problems. We provide detailed reports for each specific type of service. Download Engines Engineering catalogue and discover all services. 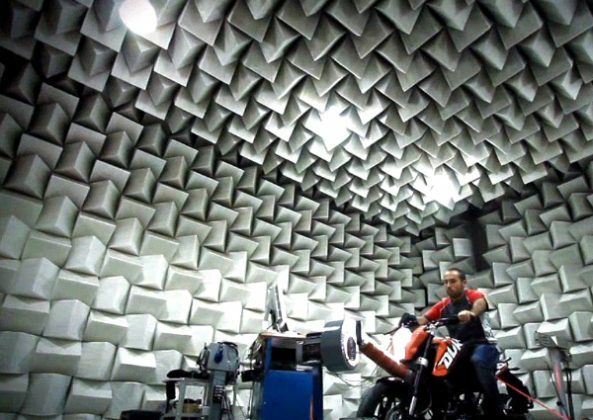 Semi-anechoic chamber (6.6 x 8.1 x 4.2) ISO certified (3745-2000). Frequencies range 125Hz-10000Hz. Background noise 21dB (A). Many years of experience in the field, helped by equipment for high-end acoustic measurements, to deter define the vehicle’s sound according to the Customer’s needs. Such service consists of the analysis of the behavior of the vehicle and the components’ life by simulating the road disconnections on Cam Drum bench. It is performed to simulate road stresses by recording data through sensors that analyze the forces in the critical areas of components. It is carried out to calibrate the engine and easy its integration into the vehicle. A roll bench equipped with a wide range of sensors allows such activity. Validation of starting and first acceleration, at controlled temperature, in a variable range from -30 ° C to room temperature. They are carried out to develop new engine configurations. The room, kept at controlled temperature, is equipped with an eddy currents engine bench. They consist of measuring the exhaust emissions in order to make the vehicles conform to the main regulations in force. They have the purpose of verifying the endurance and the reliability of the vehicle by simulating road routes or other via a robotic bench. They consist of measuring the evaporative emissions in accordance with the most important regulations currently or soon in force. They are carried out to confirm the structural strength of a vehicle component by using benches that simulate the road stresses. They have the purpose of numerical simulations integrating into the process of project development to estimate and solve possible structural problems. It consists of the detection of the vibrations induced by the engine that limit comfort and reduce the life of electronic and mechanical components. They play an essential role in the design choices and their validation. The results of road and track tests are analyzed by professionals.